I just love March! Not only is March music in our schools month, it’s my birthday month, it’s my first born child’s birthday month, my grandson and grand daughters birthday too. 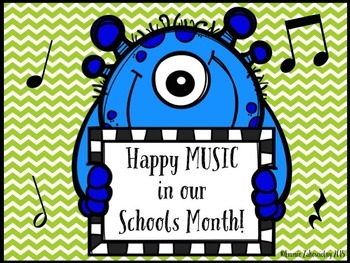 So there’s a lot of reasons to celebrate along with Music in our School’s Month (MIOSM). Publicity is a key factor in making everyone aware of the celebration. You’ll want to tell everyone about your plans to celebrate Music in Schools month (MIOSM). Print and Post posters and printables everywhere! 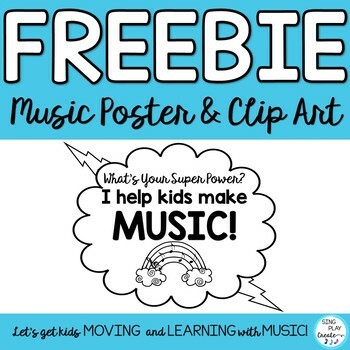 Use this FREEBIE MUSIC GRAPHIC FOR T-SHIRTS It’s CLIP ART and you can put it on any color paper that you like, or a t-shirt, mug-anything! Most importantly, share your enthusiasm for music education with your parents, peers and students. I’m going to use the posters in our school newsletter, on the walls, bulletin boards and I can use the jpegs from the powerpoint on FACEBOOK, PINTEREST, INSTAGRAM and other Social Media sites. This product comes with cards too! Get this FREE RESOURCE by SUBSCRIBING to the SING PLAY CREATE RESOURCE LIBRARY HERE. In addition, you can print these and pass them out to your students. Who doesn’t need a bookmark? MUSIC IN OUR SCHOOLS MONTH IDEA #2: WRITE ABOUT IT! You could hold an essay contest, poster contest. My Kinders, First and 2nd Graders will use the Primary Printable and write a few sentences about why they like Music in their school. Try having students brainstorm their ideas about why music is important to them. Next, have your students write a short paragraph on their ideas about why music is important. Ultimately we’ll all want to have students compose a short RHYTHMIC or MELODIC phrase and post them on a bulletin board, wall or use them as practice for your other classes? Consider having students play their compositions, or try putting them all in a pile and let students choose one to play. MUSIC IN OUR SCHOOLS MONTH IDEA #3: DANCE ABOUT IT! During the month of march I teach my Instrument and Multicultural Music unit throughout March-April. As I teach students my St. Patrick’s Day Game Song and listen to sound files, look at pictures and play Instrument recognition games, I’ll be pointing out that these are the reasons they might like Music in their school. All of these lesson ideas are in this visual and informative blog post: MARCH FOLK SONGS TO EXPLORE AND EXPERIENCE. My student SING, DANCE, PLAY MUSICAL INSTRUMENTS, which helps them musically, socially and academically. I use this song and lesson “St. Patrick was a Gentleman”. ST. PATRICK WAS A GENTLEMAN- Sing Play Create Lesson– history-dance steps and a simple arrangement of the song for you to use in class. Here’s a FREE ST. PATRICK’S DAY PLAYLIST WITH INSTRUMENTS, MUSIC AND CULTURE VIDEOS ON YOU TUBE. All you need to do is to SUBSCRIBE to the FREE RESOURCE LIBRARY to gain ACCESS to all of the Free Resources I’ve created to help you and me teach music. Consider teaching folk dances in the the month of March. You’ll find some ideas and resources in this blog post. MUSIC IN OUR SCHOOLS MONTH IDEA #4: DECORATE FOR IT! Here are some of my favorite bulletin boards I’ve noticed on Pinterest and in other blogs. Hopefully they’ll inspire your creativity! Don’t you just lov this one because it’s simple using the big letters MIOSM and student posters and notes about Music. Next, this one is another easy to do bulletin board for MIOSM. I personally like the simplicity of this one and the “active” words. I can see student work on it along with the pictures. 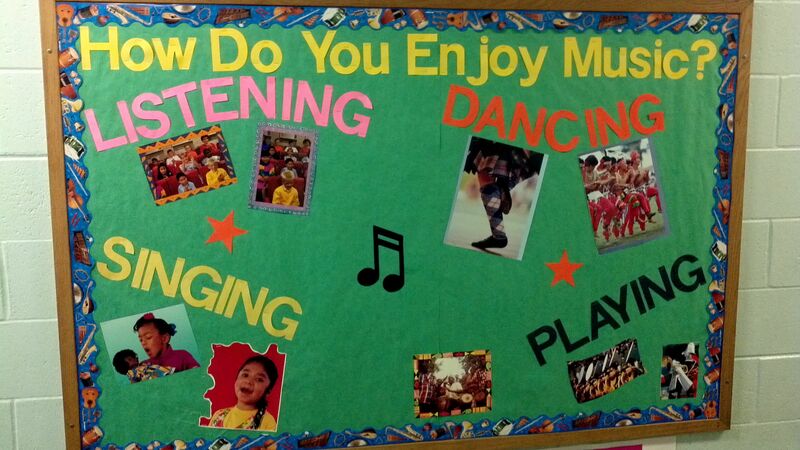 Or this lovely Bulletin board idea from my friend Ginny over at Ginny’s Music Space. MUSIC IN OUR SCHOOLS MONTH IDEA #5: PERFORM! Hold special performances during the month to highlight MUSIC IN OUR SCHOOLS. I love the idea of scheduling some informal performances for students to showcase their musical skills.You might try having just one week of special performances or maybe doing some on a special day or on one day of the week. I know that when I’ve had students perform in the main hallway that everyone is very quiet and they really enjoy hearing the music before school starts. If you’re really gung ho, you could have a whole assembly to celebrate MIOSM. Because I’m a performer too- I’ve composed 3 songs for MIOSM. All three songs are acapella and easily adapted to any grade level. You can even use them as a chant with some percussion instruments. Here’s a sample of the three songs. Here’s hoping you’ll share these ideas to celebrate and promote March is music in schools month. Please share this article with your teacher friends! 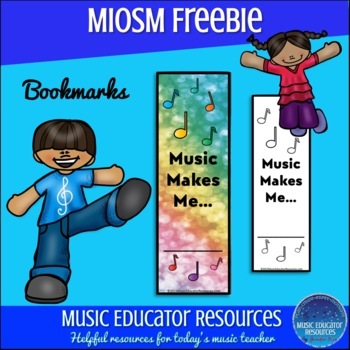 MORE MIOSM IDEAS- You’ll want to read these blog articles that have more details and ideas for you to celebrate Music in our schools month.